There’s a long, well-documented history of Dead Island 2’s struggling gasp for air and shambling stride towards release. Originally a project for Spec Ops developers Yager, it was moved onto Sumo Digital by publishers Deep Silver after “respective visions of the project fell out of alignment” between the two. With that sort of legacy, it’s easy to see why some saw the Steam page disappearing yesterday as a sign of cancellation – but Deep Silver reassure us that everything’s fine. 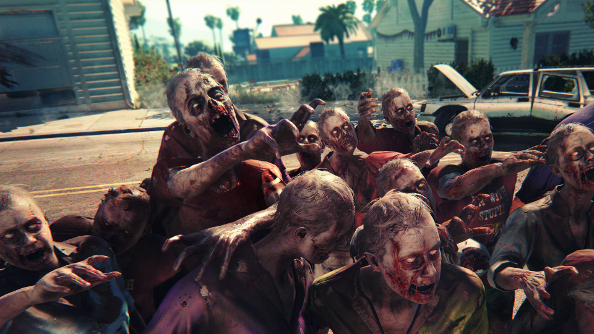 We’ve got some recommendations for the best zombie games. First spotted by NeoGAF, the Steam page popped its clogs silently yesterday. Thanks to Google, you can see a cached version of it with the various screenshots and videos. It’s a fairly standard page, though clearly quite out of date, still listing Yager as the developer and using the game’s first press shots as images, with little information. We contacted Deep Silver about the disappearance, and they let us know that “Dead Island 2 is in development with Sumo Digital. Once we have new details to share, we will do so.” That’s a fairly standard response, and could indicate that talks are ongoing, but for now the game is still in development. Some have speculated that it could be preparation for a re-reveal of the game in whatever form Sumo have decided on, worthy of wiping any out-of-date materials from places of sale. The trailer for the game is still on the official channel, so it’s not like they scrubbed it from the internet entirely. This close to E3, that would be your best bet for where we’ll see more. If we don’t – not a great sign.